Tonight’s moon is only a prelude to the full Hunter’s Moon that will grace North American skies tomorrow – on Friday evening, October 22. 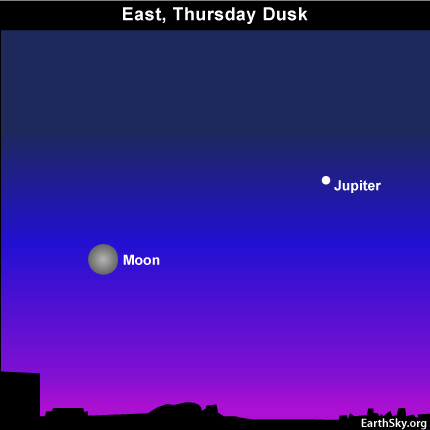 Nevertheless, the moon looks plenty full tonight, too, as it parades across the sky from dusk until dawn. The moon will reach the crest of its full phase tomorrow at precisely 8:46 p.m. Central Time (9:46 p.m. Eastern Time, 7:46 p.m. Mountain Time, 6:46 p.m. Pacific Time). Elsewhere in the northern hemisphere, the full Hunter’s Moon will fall in the wee hours after midnight tomorrow (on Saturday) in Europe, and during the daylight hours on Saturday in Asia. The full moon will take place at 1:36 Universal Time on Saturday, and our time zone chart will enable you to find out the precise full moon time for your part of the world. The full Hunter’s Moon is the name for the full moon that immediately follows the full Harvest Moon. The title of full Harvest Moon belongs to the full moon occurring closest to the autumnal equinox. In 2010, the September full moon fell only 6 hours after this equinox. What’s special about the Harvest Moon? Be aware that the Harvest and Hunter’s Moons are seasonal events, and of course the seasons are opposite in Earth’s northern and southern hemispheres. These moons are northern hemisphere events, then. In the southern hemisphere around now, people are seeing a moon whose characteristics match those of our springtime full moons. What are the characteristics of the autumn full moons? The Hunter’s Moon – like the Harvest Moon – is famous for ushering in dusk-till-dawn moonlight for several nights in a row. At mid and far northern latitudes, the lamp of the Hunter’s Moon helps to compensate for the waning October daylight. Nature provides a balance, for us Earth dwellers. The autumnal equinox for the southern hemisphere comes in March every year. The southern hemisphere will see its next full Harvest Moon on March 19, 2011, and its next full Hunter’s Moon on April 18, 2011.